Red is undoubtedly a favorite color for regional gardens and CORONADO® Red hyssop is perfectly suited to bring color, texture and fragrance to your personal paradise. What sets CORONADO® Red apart from other hyssops is the distinctive color blend of crimson and maroon in the flowers that evoke the red rock hues so prevalent in Colorado and the west, the very colors that inspired the name of our state. 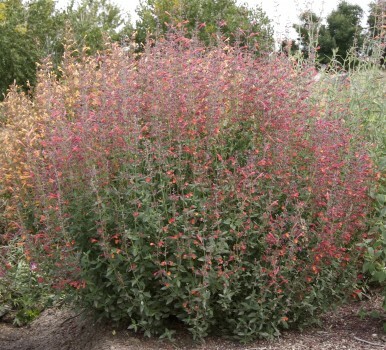 This unique selection comes from Welby Gardens and carries with it all the wonderful attributes we have come to expect from other Plant Select® agastache introductions such as SUNSET®, SONORAN SUNSET® and CORONADO®. The winning traits include a long flowering period from July into the weeks of September and the ability to grow in average garden soil with light amendment of organic material. Another admirable aspect of CORONADO® Red is its adaptability regarding moisture. It will tolerate dry conditions and perform beautifully with moderate irrigation every 10 to 14 days, but won’t object if watered more frequently on occasion. The softly textured blue-green foliage carries the mildly minty aroma that has become associated with hyssops in general, a pleasant reward for gardeners and visitors. The nectar rich flowers are a calling card for hummingbirds and resistant to damage from deer and rabbits. When you consider the complete offering, CORONADO® Red is hard to resist. It’s a beautiful companion to other sun-loving perennials, it thrives in average garden soil, it requires little more than cutting back last year’s growth to make way for the new and it will grow and flower well with moderate to low watering. But the color is what will win your heart. The unique blend of red tones is striking but subtle at the same time. It is a colorful Colorado red. Enjoy it in your garden soon. Thanks to Harriett McMillan, Echter’s Greenhouse & Garden Center, for writing this piece.